A small group of students at Scappoose High School staged a walkout Friday, Nov. 18, with the goal of showing others that bullying and discrimination are not acceptable. 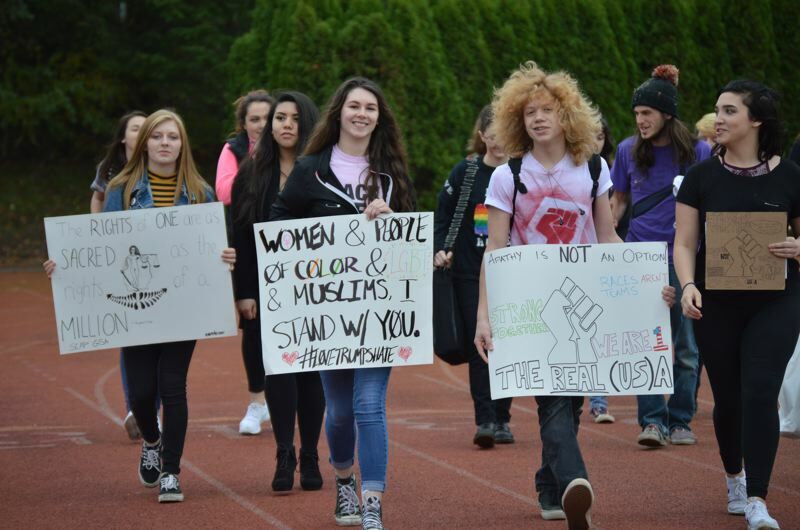 The students held the protest to show support for those who have been bullied on school grounds in the wake of a controversial presidential election. Approximately 15 students walked out of class at 1:30 p.m. and held a quiet demonstration on the high school football field, walking around the track to sit in the bleachers. During the walkout, students spoke to one another about their experiences of being shoved, pushed and called names because of their gender and sexuality. Several openly gay and transgender students spoke about the discrimination they have faced over the past two weeks. Students like Luke West, an openly transgender student at the school, said he was shoved and called names in the school hallways, and walked out of class to show sympathy for other students in the school going through the same types of bullying. Sierra Nagel, who said she was called derogatory names, pushed into lockers in the hallway, and had rumors spread about her sexuality, wanted to stand up for herself by joining the protest. It's about getting more people to come together and stand up together against hate, Nagel said Friday from her seat in the bleachers. The small walkout was organized partly by students in the Gay Straight Alliance club at the high school, but grew to include students non-club students who wanted to participate for myriad reasons. "We are protesting because we all of this hatred, fear, racism, biogrty and intolerance is now considered acceptable," Katelyn Bond read from a statement preparred by a staff member who was not present at the protest. The students who participated received some criticism from their peers as well as backlash on social media saying they were protesting for no reason, or they were misguided in their political beliefs. Principal Jim Jones supervised the event and listened quietly off to the side while students made short speeches. Prior to the walkout, Jones said the students notified him about their plans to skip class to hold the demonstration, and spoke directly with several of them. He explained that students are entitled to their right to free speech, and said often there are consequences for particpating in civil disobedience. The students knew that going into the protest, he said. If you're going to do something to articulate your message, make educated decisions about it, Jones said. Students were required to attend a four-hour supervised work session Saturday to make up for the class time they missed. Jones explained the consequences are standard for any student who skips class, yet remains on school grounds. The school district has also distributed a document to all staff to remind students that harassment of any form will not be tolerated on school grounds. Staff at Scappoose High School has been responsive to students complaints about bullying, and have asked several students who reported being pushed or verbally attacked to report those incidents to office staff.